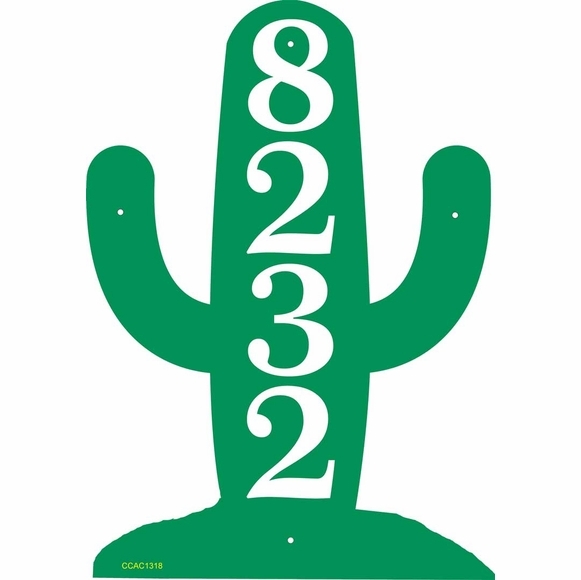 Cactus Shape Address Plaque - - southwestern theme desert cactus house number sign. This vertical cactus sign is perfect for anyone looking for a something a little different. Wall mount. Custom made to order in the USA. The cactus silhouette comes in two sizes: small 9"W x 12"H x 1/8" (shown in the small black cactus image) with two holes; and large 13"W x 18"H x 1/8" (shown in the main image and small green cactus image) with four holes. Made from sturdy, UV-stabilized, non rusting laminated acrylic with engraved personalization. Characters are permanently engraved during the production process. The smaller 12" x 9" cactus will hold up to three (3) 3" vertical characters. The larger 13"W x 18"H cactus will hold up to three (3) large 4" vertical characters or four (4) 3.5" vertical characters. Note: the style number you see on the sample signs are for internal use only and is not part of your custom sign. Cactus Shape Address Plaque with southwestern theme. Comfort House exclusive. Made to order in the USA.